WASHINGTON (CNS) — A woman religious and two Catholic peace activists were sentenced to prison for several years for breaking into a Tennessee nuclear weapons facility and defacing its walls in July 2012. 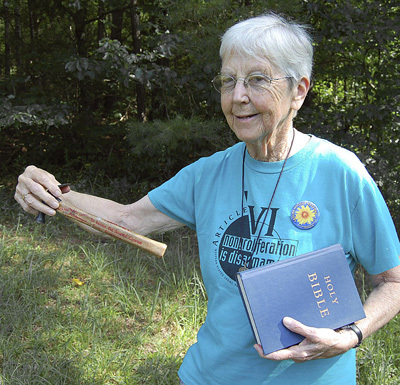 Sister Megan Rice, 84, of Washington, a member of the Society of the Holy Child Jesus, was sentenced Feb. 18 to 35 months in prison on each of two counts — one count of depredation of property and one count of sabotage. Michael Walli, 65, also of Washington, and Greg Boertje-Obed, 58, of Duluth, Minn., were sentenced to 62 months in prison each on the same counts. All of the sentences were to be served concurrently and the three were to be credited for the nine months they have been held in prison since their conviction in May. In announcing the sentences in a courtroom overflowing with supporters of the protesters, U.S. District Judge Amul R. Thapar said he respected the trio’s commitment to peacemaking but that he settled on the sentences, in part, to act as a deterrent to future actions by the defendants or by others at the country’s nuclear weapons facilities. All three faced sentences of about six to 10 years on each count under federal sentencing guidelines. They have participated in similar protests prior to their 2012 action. Attorney Bill Quigley, who represented the activists pro bono, told Catholic News Service Feb. 19 all three protesters were prepared to accept any sentence the judge handed down. “Sister Megan told me if the judge released her, that would be a victory and if she was sentenced that would be a victory,” Quigley said. After hearing her sentence, Sister Megan “raised her palms and just smiled,” Quigley said. “She’s in great health. She enjoys the people she’s in prison with and she feels she’s performing a ministry there,” he added. Quigley also said that Walli, a Vietnam War veteran, and Boertje-Obed, were calm after the sentences were announced. “People in the courtroom sang for them, prayed for them,” the attorney said. The hearing was continued from Jan. 28 when a snowstorm closed federal offices in Knoxville. At the time, Thapar ordered the protesters to pay $52,953 in restitution for fence repairs, cleaning a warehouse where bomb-making uranium is stored and security improvements at the Y-12 National Security Complex in Oak Ridge, Tenn. The judge said the defendants could arrange to make payment quarterly given their limited incomes. “I don’t think the government has any expectations that they are going to be making any restitution,” Quigley said. During their trial the trio admitted cutting through a fence at the complex, pouring blood on the warehouse, hanging crime scene tape, hammering off a small chunk inside the most secure part of complex and praying as they waited for security officials to arrive. They testified that their actions were nonviolent and symbolic and were designed to call attention to the dangers of U.S. nuclear weapons production at the massive plant. At the same time they denied their guilt in violating federal law, saying their actions were motivated by their faith and the necessity to end what they consider the evil of nuclear weapons production. Steven Erhart, National Nuclear Security Administration manager at the weapons facility, said in the trial that the break-in harmed the site’s credibility and it also exposed security flaws that have since been repaired and improved.